"The discovery and extraction of shale gas in the United States has been a revolution. Gas prices have fallen, driving growth in the American economy and pushing down prices for consumers. The US has become less reliant on imported foreign energy and is more secure as a result. 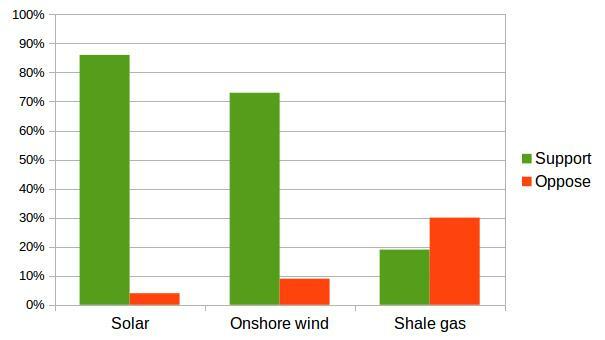 And because shale is cleaner than coal, it can also help reduce carbon emissions. We believe that shale energy has the potential to do the same thing in Britain, and could play a crucial role in rebalancing our economy." This is fantasy. As well as the climate impacts and the questionable economic calculations (Sam Hall, of the think tank Bright Blue, explained in the Independent "As the UK is part of a large European gas market, the impact of fracking on consumer bills is likely to be minimal... the Conservatives’ priority should be incentivising cheap renewables, which are attracting the majority of new energy investment worldwide, as part of its modern industrial strategy.”) fracking is extremely unpopular, especially compared with renewable energy (the graph on the right shows the latest government survey of attitudes). Fracking will not help the environment, nor lower energy bills, nor is it a vote-winner. The Conservative Party's manifesto has rolled back a bit on the 2015 election manifesto pledge to 'halt the spread of onshore wind'. 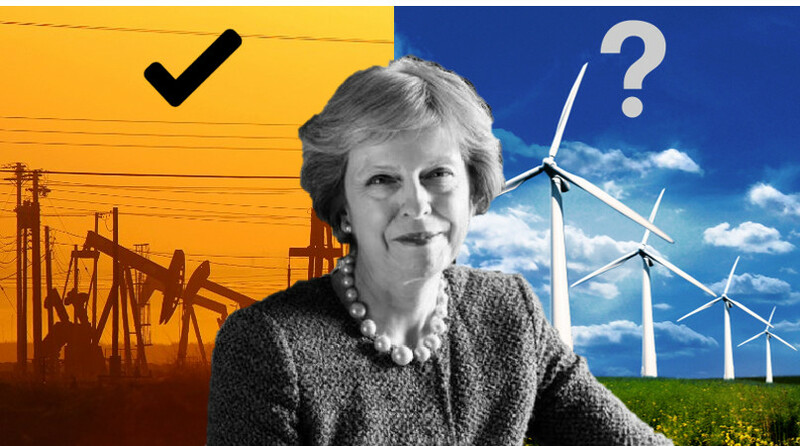 The 2017 manifesto merely states opposition to large-scale onshore wind in England, with support for offshore wind development and wind farms in the remote islands of Scotland. The door is left open therefore, to smaller scale developments and perhaps also wind farms in mainland Scotland - even Wales... How much this actually happens will depend on removing practical obstacles that have been put in the way of development. The manifesto also promises to "commission an independent review into the Cost of Energy, which will be asked to make recommendations as to how we can ensure UK energy costs are as low as possible, while ensuring a reliable supply and allowing us to meet our 2050 carbon reduction objective." But anyone interested in lowering the cost of energy might be interested to learn that the day before the Conservative manifesto was launched, the results of an energy auction in Spain were announced. Wind energy contracts were awarded for a price of €43/MWh, lower than the UK wholesale power price and a third of the cost of the price agreed for energy from Hinkley C nuclear power station. There are positive elements - reaffirming support for the Climate Change Act and for the Paris Climate Deal, ambition for electric vehicles and an industrial energy-efficiency scheme. There is promised support for offshore wind, but solar energy doesn't get a mention. Heathrow expansion is in the manifesto - a serious threat to our climate targets. Further analysis. With the past two years having seen many backward steps on climate action, climate campaigners will be looking for any signs of hope. One of the most telling things is that the manifesto was framed around 'Five Giant Challenges' - and climate change doesn't get a look in. Want to read more about different parties' manifesto climate commitments? Carbon Brief have put together a useful table. A late addition, the text below is taken from a press release from Frack Free Isle of Wight - we thought it was a very clear explanation. Frack Free Isle of Wight members have expressed dismay and outrage after reading the Conservative Party manifesto 2017(a). Firstly, it promotes the belief that the UK could replicate the US ‘Shale Gas Revolution’ despite there being no evidence to substantiate this. It is already widely accepted that factors such as geological differences and an obvious lack of vast expanses of sparsely populated areas support the contrary opinion that a UK shale gas revolution is far from likely. In fact, the UK Energy Research Council, an academic consortium covering 30 institutions, produced a report on the future of gas in the UK and suggested that shale gas in the UK has been completely oversold. So, what does this mean? In a nutshell, it means non-fracking wells will no longer need planning permission. However, as if that wasn’t bad enough, thanks to a gaping loophole created by recent changes to the Infrastructure Act which introduced a very specific political definition of fracking(c) based solely on the volume of fluid used, what this means in reality is even more disturbing. If this plan goes ahead it will enable thousands of oil and gas wells to be drilled without any requirement for planning permission whatsoever, regardless of whether they are conventional or unconventional, single or multiple well pads, vertical or directional drilling, using acidisation or other chemicals and stimulation techniques. All ‘non-fracking’ wells. But here’s the twist. Because of the loop hole definition, a non-fracking well CAN be fracked so long as it isn’t expected to exceed the specific volume of fluid in the definition! Using this same definition, a large proportion of the wells fracked in the US shale revolution would be defined as non-fracking wells, as would Cuadrilla’s infamous Preese Hall well in Lancashire, closed down in 2011 after causing 2 earthquakes but only using 8,400 cubic metres of fluid - short of the 10,000 cubic metres required for it to be defined as fracking. We therefore call upon every Conservative Party member, supporter, donor, Councillor, MP, prospective MP and voter to demand Theresa May rescind this policy with immediate effect. Frack Free Isle of Wight are a grass roots voluntary organisation committed to raising awareness of issues surrounding fracking and other fossil fuel exploitation.